Now, let’s look at the word “hospitality”. When someone gives you a friendly and warm reception or entertains you, like treating you to dinner for example, you’re receiving “hospitality”. Naturally, you want to thank them for their hospitality. 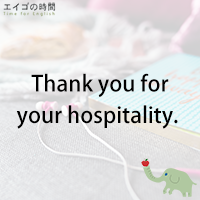 You say, “Thank you for your hospitality”. My host responded by saying “You’re welcome and I enjoyed your company”. “I enjoyed your company” is also a good phrase to remember. But let me discuss it in the upcoming post. I think it’s best to learn one phrase at a time.